Okay, now you've had that award-winning brochure or catalog printed through Page Marketing Solutions. But how are you going to get it into the hands of the masses? Distribution through public brochure racks, at special events like conventions and festivals, or one-to-one at the start of sales appointments are all viable. But there's nothing like direct mail to make the most impact—especially when a mass mailing is followed up with a phone call or personal visit. 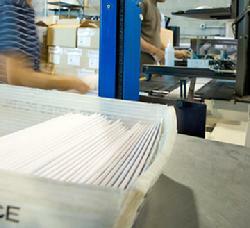 We have partnered with a tech-savvy mailing specialist just down the road from our Virginia office—1st Class Services. Linda Greene and her staff can take your own mailing list in one of several formats, "clean" it using post office approved software to update or delete addresses that have changed in the past 48 months, and yield a new list that will reduce waste and maximize direct mail opportunities for you. Next, 1st Class can affix the "good" labels to your mailing piece, sort and bundle them according to postal service regulations, and fill out all the USPS paperwork for you. No need for you to purchase a postal permit, just use theirs! If your mailing requires wafer sealing, 1st Class can do that as well. 1st Class Services is located within walking distance of a major postal service bulk mail handling facility so once their work is done it is a quick process to get your literature in the mail. If you know you will be using 1st Class to prepare and process your mailing, just let us know and we can plan to deliver a portion of your press run to them. No extra charge! In addition to processing a mailing comprised of names you provide, explore the myriad lists available through 1st Class Services. You can specify geographic areas by zipcode, age, gender, lifestyle attributes, and income levels. You can literally zero in on your best prospect profiles and include them in your mass mailing.